Bender showing Fanny that he stepped on a leprechaun (ItWGY). The leprechauns are fairies who store away all their coins in a hidden pot of gold at the end of the rainbow. Bender of universe 1 has stolen a pot of gold from the leprechaun universe (4ACV15) and Bender of universe Γ has called Nibbler a leprechaun (BG), stepped on a leprechaun (ItWGY) and been chased by three leprechauns on surfboards together with Morris and Fry, presumably, after stealing a pot of gold from them (7ACV05). ^ Matt Tobey (29 May 2012). 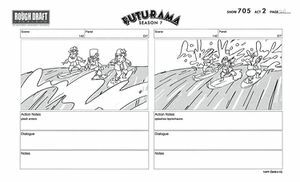 Countdown to Futurama: Leprechauns Storyboard. (Comedy Centrl [sic].) Retrieved on 29 May 2012. This page was last edited on 6 July 2015, at 22:06.